It is important that you understand the requirements needed for your company to become SECOR certified, and familiarize yourself with the process we have in place to help you prepare. Before you get started, first ensure your company is eligible. 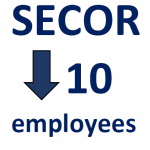 SECOR is limited to an employer that has no more than 10 employees at any given time. We cannot accept an application for SECOR for employers with more than 10 employees. If you have more than 10, you will need to apply for a COR instead. The Small Employer Certificate of Recognition (SECOR) program is a proven way for small employers to improve their health and safety performance, create a workplace culture of proactive health and safety, and reduce the risk and costs associated with workplace incidents. With a validated health and safety management system, your company can identify and assess your workplace risks, then systematically control hazards to protect your employees. This ongoing process will allow you to build a workplace culture of proactive safety complying with occupational health and safety (OH&S) regulations and promoting continuous improvement. Another requirement to qualify for SECOR is that your company must be a member of the ACSA. Your company will be required to have an active Alberta WCB account. Please visit the Ministry of Labour website for approved First Aid training facilities. ACSA now offers Saint John Ambulance first aid training at the Edmonton, Rocky View, and Fort McMurray locations. Develop and implement your health and safety program. Once the program is in place and you have gathered a minimum of three months’ worth of health and safety documentation, you will complete the SECOR Evaluation Tool (refer to the Downloads section on this webpage). Once a SECOR is achieved, it is typically valid for three years. In the interim two years, the company will have to complete a SECOR maintenance on the SECOR evaluation tool in order to maintain its SECOR certification and be eligible for the PIR refunds. Every three years, at least one full-time employee must complete any ACSA accredited course to remain eligible for SECOR. This maintenance requirement is no longer restricted to the assessor, and the list of ACSA courses is no longer limited. It is the company’s responsibility to be up-to-date with the SECOR training requirements at the time of evaluation. The individual who completes the Small Employer Evaluation Tool is known as the assessor. This person can be internal or external to the company and must have a certificate in PHSM. Anyone in the company, the assessor or someone else, can then choose to attend any ACSA accredited course every three years to be eligible. If an external assessor is chosen, the company will still need to have on the payroll a full-time employee holding the required training. As part of a health and safety program, your company will need to ensure your employees are aware of the legislation that is applicable to the work they are performing. The Small Employer Evaluation Tool requires companies to attach a list of relevant sections, or parts of the occupational health and safety legislation that apply to their workplace, and work activities. Click here to access sample information for your industry code. Please note: These documents are guidelines only. Employers have a responsibility to assess all applicable occupational health and safety legislation for the tasks they are performing.